We don’t do boring! We’re all about energy and synergy. And paying that feeling of fabulous forward! Step into your nearest Sorbet store with your exclusive 10% OFF ANY treatment, Mon-Wed and step into the new year like you own it! Carry on reading to see exactly what stores you can expect to treat yo’self at! Relax, rewind and recharge today with 10% off at your favourite Sorbet store as a Varsity Vibe member! Sorbet is your nationwide beauty therapy hub with over 200 Stores countrywide. They’re all about hot towels, hot wax, manicures and pedicures, brows, lashes, blowouts and bro-outs, hollywood, brazilian, swedish and gelish. They paint and they dip, they deep cleanse and they deep tissue. They do not deep sleep, they leave that for the day spa!. And now they’re all about the vibe! It’s your year to get “that” Sorbet feeling. This one is for the guys! Get your new year swag on with Sorbet Man and Varsity Vibe right now! Sorbet Man is your quintessential ‘man cave’ offering haircuts, hot towel shaves, massages, facials and more. 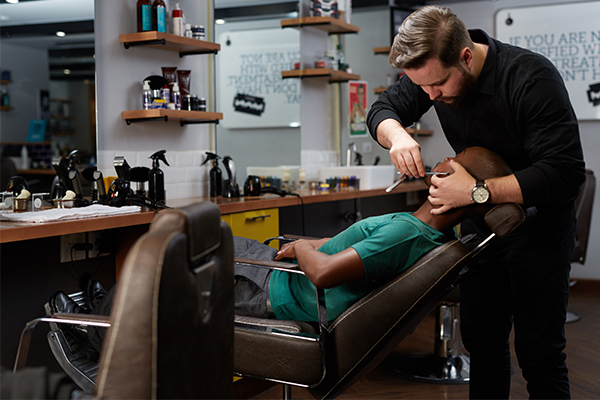 Sorbet Man barbers and therapists consist only of trained and qualified professionals that put their Sorbet stamp of excellence on every service they deliver. 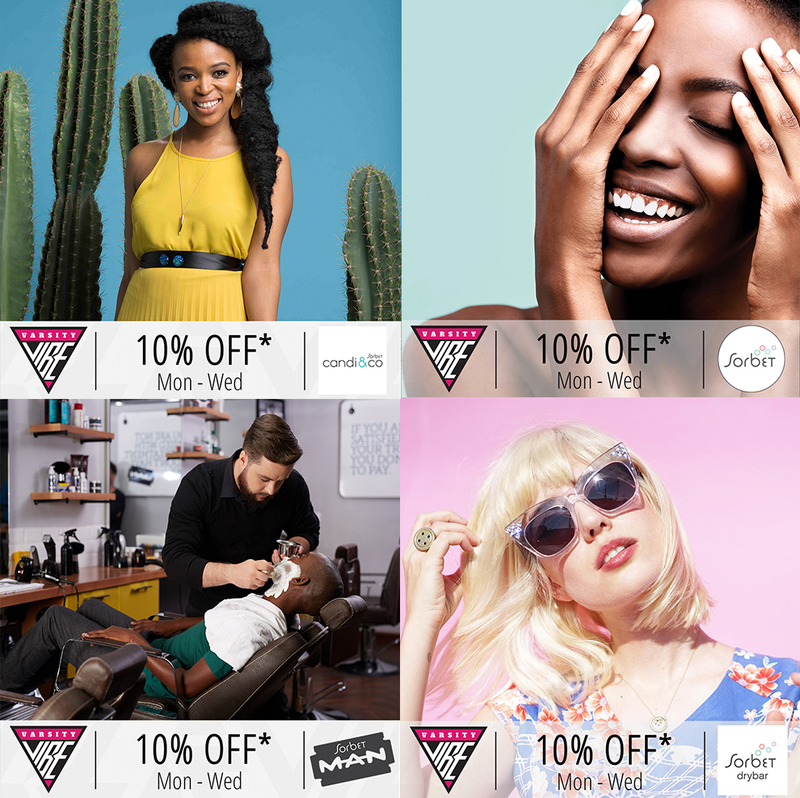 Take the gap, grab your 10% discount at any Sorbet Man store! Sorbet Drybar and Varsity Vibe are really all about you! Grab your 10% discount on us! Step in and strut out looking fabulous! They’re all about speed and convenience, with a big scoop of the Sorbet experience you’ve come to love and expect. You may think they’re just another hair salon. Not quite. Sorbet Drybar has been developed for you and your lifestyle! They offer affordable blow-drys, manis, pedis and much more in a relaxed, funky environment, complete with in-salon entertainment to give you ‘that feeling’. No cuts or colours. They’re in-and-out. Quick-quick! Plus their salons are open seven days a week! Find your nearest Sorbet Drybar here and enjoy a pamper or spruce up today! Get head-to-toe glam at Candi&Co. with your exclusive 10% OFF as a Varsity Vibe member! Candi&Co. is Sorbet’s one-stop hair and beauty salon that specialises in hair growth, naturalistas, weaves, wigs and braids. What’s more is while you look after your crown, Candi&Co. provides nails, brows and lash services. By popular demand they have recently added facials, waxing and massages in some Candi&Co. stores! And just when you thought their fabulosity stopped with your hair, they’ve got more in store for you! You can enjoy FREE wifi and complimentary delicious bubbles while getting your Candi-Coating! To redeem your discount, simply show your completed “My Profile” screen (containing a profile pic of yourself) to the staff member at the till. Once they have seen and confirmed the validity of your profile pic and the expiry date, they will process the deal and you too can enjoy the vibe!